Prior Marine Presence in Helmand Province. There was a very large Marine presence in Helmand province for many years. The last Marines left in October 2014. Camp Leatherneck, located adjacent to the British Camp Bastion, housed thousands of Marines. Many smaller combat outposts (COPs) were spread throughout the province. In 2011, when the U.S. had its highest number of troops in Afghanistan, there were about 20,000 U.S. Marines in Helmand province – along with thousands of British soldiers as well as military contingents from Denmark, Georgia, Estonia, and other nations. 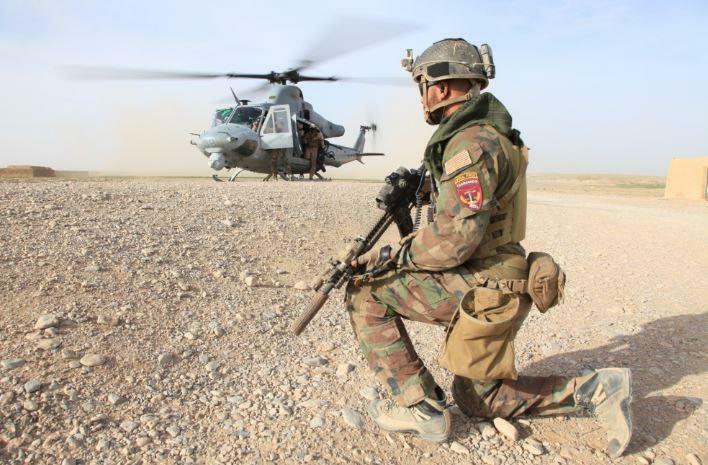 MARSOC Marine from Special Operations Task Force West provides security at LZ in Nahr-e-Saraj district, Helmand province. (Photo by Cpl. Kyle McNally, 28 Mar 2012). RCs Became TAACs and RC-SW Shutdown. With the Obama Administration deciding on a significant draw down of U.S. forces during 2014 leading into 2015 planners at the International Security Force Assistance (ISAF) headquarters decided to strip away the full-time advisory support from the Afghan National Army’s 203rd Corps (SE Afghanistan) and 215th Corps (SW Afghanistan – Nimroz and Helmand provinces). The other ANA Corps (201st, 205th, 207th, and 209th) would retain their NATO and U.S. Advisors on a persistent, full-time basis. The 2-star level Regional Commands (RC-East, RC-South, RC-West, and RC-North) would become 1-star level Train, Advise, and Assist Commands or TAACs. So RC-East became TAAC-East, RC-North became TAAC-North, and so on. Map depicting the location of TAAC’s for the ANA Corps and ANP Police Zone HQs. 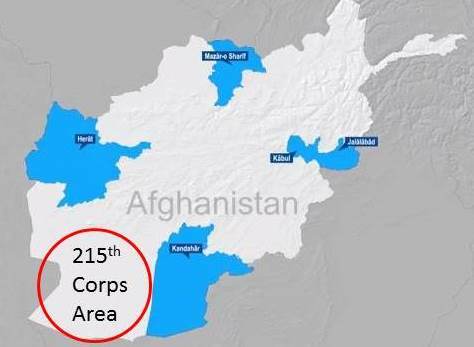 Notice the lack of a TAAC for the 215th Corps and 505th Police Zone in Helmand and Nimroz provinces. (map adapted from RS map). Security Situation Worsens in Helmand – 2015-2016. The Taliban, emboldened by the absence of foreign troops and their enablers (air support, artillery fires, logistical assistance, and ISR), went on the offensive. The 215th ANA Corps suffered defeat after defeat on the ground in Helmand province. The security environment in Helmand was getting progressively worse with each passing month. Many of the 13 districts of the province fell under control of the Taliban. Over the past two years the ANDSF have performed miserably in Helmand province. “Ghost Soldiers and Policemen”. The army and police are very under strength in personnel. Many of the soldiers and police that are on the books in the region are actually ‘ghost soldiers’ or ‘ghost police’ – meaning they don’t exist but their commanders are collecting their paychecks. The ‘ghost soldier and policeman’ problem means that the ranks are thin. Desertions of soldiers and police went up after the departure of Coalition troops, the violence increased, and casualties rose significantly. Poor Leadership. Corruption and bad leadership are a few of the many problems contributing to the security situation in the province. The leadership of the 215th Corps and 505th Police Zone HQs has been historically weak. Drug Culture. Helmand is the biggest poppy-growing region of Afghanistan and many Afghan security personnel fall under the influence of the drug lords. Drug eradication in Afghanistan is the lowest in a decade – primarily because of the poor security situation in Helmand. The opium trade has a huge impact on the economic, political and military situation in the province. Afghan police and army personnel are faced with lucrative incentives to not disrupt the drug trade. The Taliban funds a significant part of their operations with drug trade proceeds – the drug trade is worth millions of dollars. Poor Morale. Soldiers of the 215th are comprised almost completely of personnel NOT from Helmand province. Even if the soldier had a commander that would allow him to go on leave – his family home is likely in another part of Afghanistan and getting there is extremely dangerous. Many commanders will only grant leave if the soldier or policeman gives up part of his pay. This is a big cause of members of the ANDSF leaving their jobs before their contract has finished – going absent without leave (AWOL). Much of the money allocated for food is stolen by the Afghan commanders – leaving the lower ranking police or soldier with an inadequate diet. Combine the problems of bad food, horrible leadership, stolen pay, no leave, constant violence, poor MEDEVAC support, high casualties, and ghost soldiers and police and you have a province where the policemen and soldiers have low morale and very little fighting spirit. Task Force Forge. In early 2015 the U.S. Army set up Task Force Forge – an advisory and assistance force of a few hundred personnel to stem the successive defeats that the Afghan National Defense and Security Forces were experiencing in Helmand. This was supposed to be a temporary effort but it has become more permanent and by October 2016 Task Force Forge was almost 600 strong. Task Force Forge efforts were assisted by the Advise and Assist Cell – Southwest as well as Expeditionary Advisory Packages (EAPs)  from TAAC-South and Kabul providing specific functional assistance and advise. Task Force Forge had Soldiers serving in an advisory and training capacity as well as support and force protection Soldiers. It would appear that the re-establishment of a more permanent entity in southwest Afghanistan equal to the Train, Advise, and Assist Command (TAACs) found in other regions of Afghanistan is unlikely. Not reforming an entity known as TAAC-SW, is most likely to avoid sending a signal that the mission in Afghanistan is floundering and that NATO (and the U.S.) is back-sliding into a bigger commitment. Most of Task Force Forge is located at Camp Shorab with the 215th Corps but some are working with the Afghan police in the provincial capital at Lashkar Gah. In addition, there are support units located at Camp Dwyer. Subordinate units of the 10th Mountain Division and the 1st Cavalry Division have deployed as part of Task Force Forge. Some U.S. Army units may continue to support Task Force South West. Refit and Retraining of ANDSF. The 215th Corps commander and many of his brigade and kandak commanders as well as staff were replaced in 2016. The former 215th commander relieved in mid-2016 may be going to trial over corruption charges. Over the past year many of the 215th ANA Corps kandaks have been pulled out of combat, refitted with personnel and equipment, and put through a re-training period to make them combat ready once again. 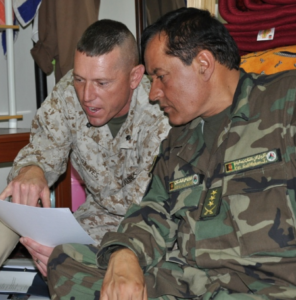 One possible mission of Task Force South West is to continue to assist in the retraining of the 215th ANA Corps kandaks as part of the Operational Readiness Cycle (ORC) that Resolute Support is attempting to get the Ministry of Defense to embrace. Helmand Province Controlled by the Taliban. For the most part Helmand province is controlled by the insurgents. The government forces occupy Camp Shorab and the provincial capital – although Lashkar Gar is constantly threatened. 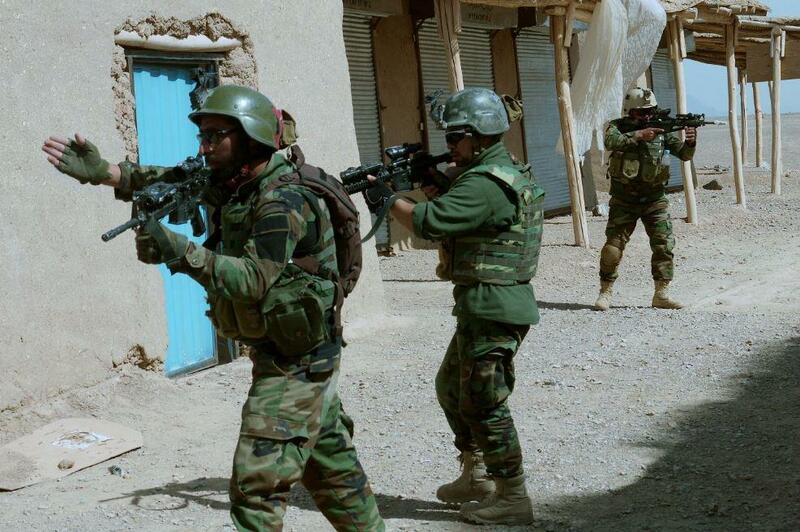 In addition, the government has troops and police in a few of the district centers of the 13 districts of Helmand. However, most of the rural countryside, many of the district centers, and much of the road networks are controlled by the Taliban. Depending on the source estimates indicate that the Taliban control 70-85% of the province. 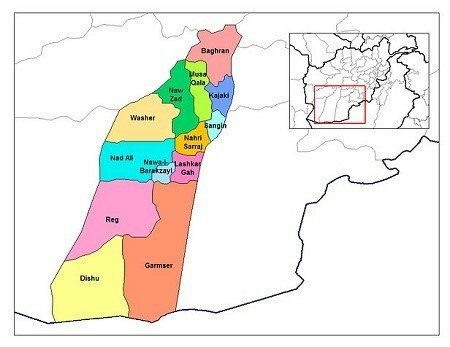 13 districts of Helmand province. (Map by WikipediA, Creative Commons license). Task Force South West Composition and Mission. The Marine TF will likely be about 300 personnel in strength. In addition to advising the 215th Corps Task Force South West will conduct a ‘train, advise, and assist’ mission with the 505th Police Zone Headquarters. The Marine unit will have many seasoned officers and NCOs – some who have deployed to Helmand province in the past. Most task force members will come from the 6th Marine Regiment based at Camp Lejeune, North Carolina as well as from across the II Marine Expeditionary Force. In addition, advisors from other Marine units who possess specific functional skills will be attached to the task force. There are sure to be additional Marine units rotating into Helmand province in the future in light of commitment to Afghanistan until 2020 made by the European Union and NATO at the Brussels Conference and Warsaw Summit this past year (2016). The Marines deploying to Helmand to form up Task Force South West have been in the middle of a month’s long training program for the Helmand mission. Task Force South West Commander. BG Roger Turner – a Marine with some experience with Helmand province – will be the commander of Task Force South West. He has two Iraq OIF (Operation Iraqi Freedom) deployments and commanded the 5th Marine Regiment from 2011-2013 – including a year-long tour to Helmand province. What Has Changed for the better in the Past Two Years? This article points out many negative aspects of the situation in Helmand province such as the drug trade, corruption, loss of territory, horrible leadership , ghost soldiers and police, and high casualties. Is anything going well? The Good News. Resolute Support headquarters would tell you that overall the ANDSF is becoming increasingly capable and that capacity is growing. The Afghan Air Force (AAF) now has A-29 Super Tucanos and armed MD-530 helicopters to provide close air support, Mi-17s to conduct air resupply and MEDEVACs, and Afghan Tactical Air Controllers (ATACs) to coordinate air support. The corps, zones, and ministries have refined its logistics systems and process so that more supplies and equipment is finding its way to the units on the front lines. Almost all of the training and education is now conducted by Afghans at the regional training centers and national level institutions. National level intelligence organizations are becoming more capable in providing targeting information to Afghan SOF units to interdict senior insurgents. The ANDSF has gotten better at planning larger operations integrating ISR, D-30 fire support, and aerial fires. The interoperability between the police and army has increased. RS HQs points out that no major cities have been attacked and held by the Taliban (that is, if we disregard the fall of Kunduz for two years in a row) and that the Taliban have not achieved any of their strategic objectives. (That is a matter of interpretation – though it is a nice sound bite). The Bad News. But the final analysis rests on the combat effectiveness of the ANDSF – and that is up for debate. The ANDSF still have not mastered the ability to conduct counterinsurgency. They can clear villages, valleys, and lines of communication with their special operations forces but when they try to hold those areas with the ANA or ANP they usually return back to Taliban control. Most of the ANDSF generals are inept, ineffective, weak, corrupt, and many don’t have a real job. The ANDSF has more generals than the U.S. military. Retention is a huge problem in the ANA. And . . . as mentioned above the Taliban control more territory now than they have at any point since 2001. Overall Summary of Afghanistan? It appears that the U.S. is in Afghanistan at least until 2020 – continuing a war where (as of January 2017) a total of 2,247 U.S. military personnel have died and more than 20,000 have been wounded. In 15 years the U.S. has spent over $115 billion on the ANDSF and Afghan reconstruction. Our attempts to facilitate ‘on-budget’ assistance to the Afghan government results in reduced U.S. visibility over reconstruction funds – opening the door to increased corruption and wasting of U.S. money. Many of the investments that the U.S. has made for the ANDSF and Afghan society in general are not sustainable by the Afghan government. Corruption in the Afghan government and ANDSF continue to erode state legitimacy, weakens popular support for the government, discourages foreign investment, and fuels the insurgency. Currently the U.S. government is spending approximately $13 million per day attempting to get the Afghan government to stand on its own two feet. The ANDSF, hampered by corruption and poor leadership, is very ineffective. 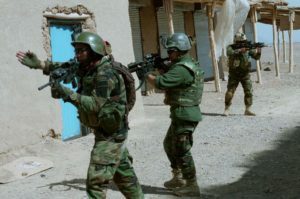 The only effective force is the ASSF – a grouping of Afghan SOF units that spends most of its time traveling around the country retaking territory that has been lost by the ANA and ANP and putting out fires. What’s New about the Mission? If you have served in Afghanistan (Helmand specifically) and you are returning for another round – what is there to know? The mission focus has changed. Resolute Support is not doing the fighting – it is a ‘train, advise, and assist mission’. Within the RS organization there is a complicated ‘security force assistance framework’ to assist the advisor in the field. Terms such as FB-SFA, OTERA, TAA, 5 Functional Pillars, MAAR, 8 Essential Functions, PoAM, ANET, SFA Center, Connect Point, and more have emerged to confuse the advisor in the field. The staff of Task Force South West will need to come up to speed quickly on the new terminology. More of the Same. However, once the SFA terminology and SFA framework is understood everything else is not so confusing. Afghanistan is still Afghanistan, the Afghans are still Afghans, Afghan culture hasn’t changed, the human terrain is still important, the Taliban have not gone away, Helmand is still Helmand, Pakistan still provides sanctuaries for the Taliban, and the art, craft, and science of advising remains the same. The Marines of Task Force South West should quickly adapt to the new environment. Can the Marines of Task Force South West Make a Difference? The Marines lost almost 400 personnel over several years in Helmand province. The British lost over 100. The Danes, Georgians, and other Coalition nations lost service members in Helmand province as well. A year ago – in 2015 – the Taliban controlled about 25% of the province. 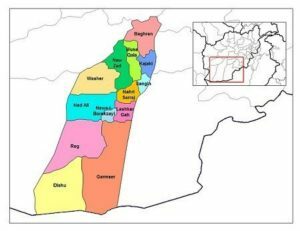 At of the beginning of 2017 it is reported that the insurgents are in control of 85% of the province. Hopefully the small contingent of Marines being sent into this troubled province will be able to make a difference but the odds are stacked against them. For facts and figures provided in this paragraph see High-Risk List, Special Inspector General for Afghanistan Reconstruction (SIGAR), January 2017. [d] Press release by USMC – “II MEF Marines Deploying to Afghanistan Spring 2017”, Marines.mil, January 6, 2017. [e] Ghost Soldiers and Policemen. While the problem of ‘ghost soldiers and policemen’ have been a persistent problem of the ANDSF in general it is particularly acute in Helmand province. In July 2016 the Commander of Resolute Support submitted a letter to the Afghan government directing (or requesting?) a “. . . viable action plan to address personnel accountability and ‘ghost’ personnel in Helmand and within the ANP overall.” (See page 74 of DoD 1225 report, Enhancing Security and Stability in Afghanistan, December 2016, www.defense.gov/Portals/1/Documents/Enhancing_Security_and_Stability_in_Afghanistan-June_2016.pdf). 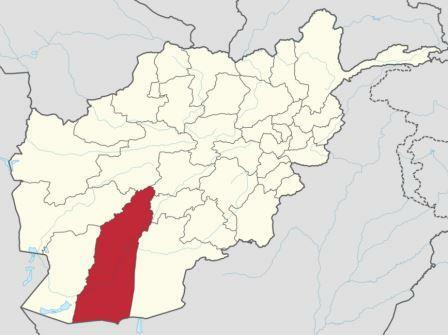 Image Credit: Map of Helmand province at top of page from Wikipedia, Creative Commons license. Updates: This article about Task Force South West has been updated with minor edits since it was first published (grammar, small mistakes, new content, recent events, and additional readings). In addition, the sequencing of the material has been adjusted to improve readability and make it a more useful resource.